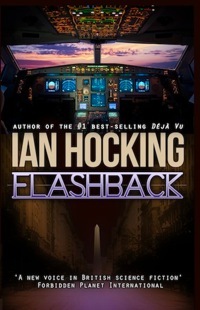 It’s been five years com­ing, but my nov­el Flashback, sequel to Déjà Vu, is now avail­able in the Kindle store. The price is £2.13 in the UK and some­thing approx­im­at­ing that in the US. To be hon­est, this is a little more expens­ive than I inten­ded. I was — and still am — aim­ing for some­thing closer to £1.80 or £1.70 and it is prob­ably mup­petry on my part that the price has come out high­er. If I can fig­ure it out, the price will prob­ably drop a few pence over the com­ing week. There are many people to thank. Beta read­ers, those who helped me with research into air crash invest­ig­a­tion and aero­naut­ics, my edit­or Clare Christian and cov­er design­er Emma Barnes of Snowbooks all get major, major props. A fifty-year-old mys­tery is about to be solved. Summer, 1947: Airliner ‘Star Dust’ radi­os a suc­cess­ful trans-Andean flight from Buenos Aires to Santiago, and sig­nals its inten­tion to land. Four minutes pri­or to touch­down, it sends the let­ter sequence ‘S-T-E-N-D-E-C’, then silence. Star Dust van­ishes along with all pas­sen­gers and crew. The enig­mas of DFU323 and Star Dust will lead back to a start­ling con­spir­acy that reaches fifty years into the past – and one hun­dred years into the future. How do I feel? I feel fine. Great news! I hopped onto Amazon and bought it imme­di­ately. Can’t wait to see what’s up for Saskia next. So did I — I enjoyed both books immensely although I should have re-read deja-vu before start­ing flash­back. Finally, an Amazon recom­mend­a­tion which actu­ally recom­men­ded some­thing I want to read! Downloaded Flashback last night and have just brought a nice bottle of red to make my way through while I read it over the week­end. Does this mean that we’re close to see­ing The Amber Rooms on Kindle soon? I do hope so. Thanks for your com­ment, Tim! Much appre­ci­ated. I cracked open the first draft of the Amber Rooms tonight — not sure when I’ll have it out for Kindle. Looks like a few months at least.